Not to be confused with Jackson, Alabama. Jackson County is the northeasternmost county in the U.S. state of Alabama. As of the 2010 census, the population was 53,227. The county seat is Scottsboro. The county was named for Andrew Jackson, general in the United States Army and afterward President of the United States of America. Jackson County is a prohibition or dry county, but three cities within the county (Bridgeport, Scottsboro, and Stevenson) are "wet", allowing alcohol sales. Jackson County comprises the Scottsboro, AL Micropolitan Statistical Area. This is included in the Chattanooga-Cleveland-Dalton, TN-GA-AL Combined Statistical Area. It is the site of Russell Cave National Monument, an archeological site with evidence of 8,000 years of human occupation in the Southeast. 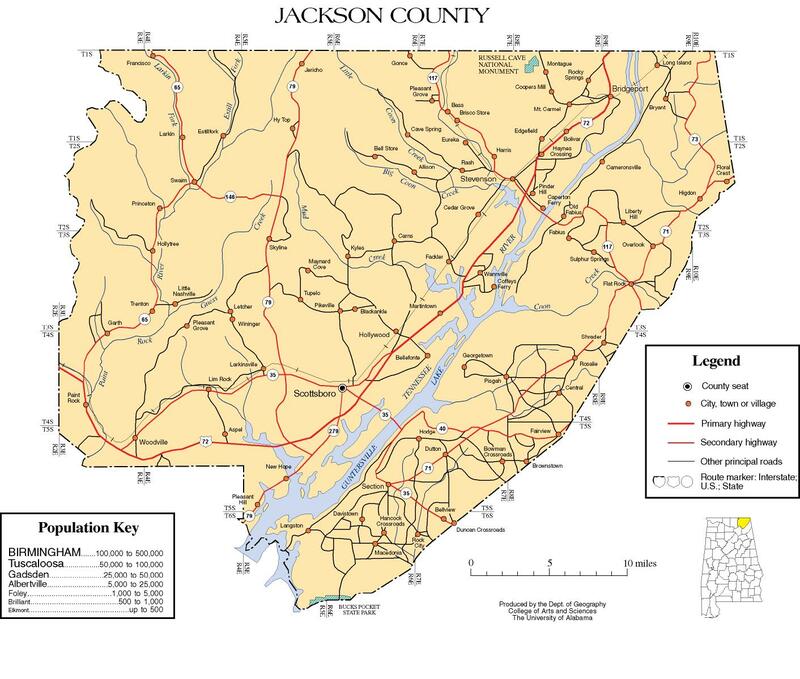 Jackson County was established on December 13, 1819, after the federal government arranged a treaty to remove the Cherokee from the area and extinguish their land claims. The hilly and mountainous terrain of the Appalachians made the area unsuitable for the plantation-style agriculture of the lowlands and coastal area. It was settled largely by families from Tennessee, South Carolina, and Georgia. This area was developed largely for subsistence farming, and few families held any slaves. For instance, in 1860, Bellefonte, Alabama, then the county seat and largest community in the county, had a population of 181, of whom eight were free blacks and the remainder were white. No slaves were recorded in that community. The county is crossed by a number of rivers and waterways; the most important is the Tennessee River, which drains most of the county. The current county seat of Scottsboro developed along the river, and was also was the site of a railroad station when railroads reached the area. Hydroelectric power was developed in the first quarter of the 20th century to generate energy for industry. By the mid-20th century, industry had replaced agriculture as the most important element of the economy. According to the U.S. Census Bureau, the county has a total area of 1,127 square miles (2,920 km2), of which 1,078 square miles (2,790 km2) is land and 49 square miles (130 km2) (%) is water. It is the fifth-largest county in Alabama by total area. Much of it is located in the Appalachians. Of special interest is Russell Cave National Monument, which is located in Doran Cove, approximately 5 miles west of the town of Bridgeport. It is believed to offer "one of the most complete records of prehistoric culture in the southeast United States." Russell Cave was declared a National Monument in May 1961 by President John F. Kennedy. The Monument consists of 310 acres (1.3 km2) of land donated by the National Geographic Society. The cave is an important archaeological site that was excavated in 1956 by the Smithsonian Institution and the National Geographic Society. The October 1956 issue of National Geographic Magazine featured an article reporting, "Life 8,000 Years Ago Uncovered in an Alabama Cave." Evidence was found of human occupation of the cave from 6200 B.C. to A.D. 1650. The article was written by Carl F. Miller, the expedition leader. There have been follow-up studies about this site. As of the census of 2000, there were 53,926 people, 21,615 households, and 15,822 families residing in the county. The population density was 50 people per square mile (19/km2). There were 24,168 housing units at an average density of 22 per square mile (9/km2). The racial makeup of the county was 91.89% White(non-Hispanic), 3.74% Black or African American, 1.75% Native American, 0.23% Asian, 0.02% Pacific Islander, 0.36% from other races, and 2.00% from two or more races. 1.61% of the population were Hispanic or Latino of any race. In 2000, the largest ancestry groups in Jackson County were English 69.1%, Scots-Irish 5.21%, Scottish 4.67%, and African 3.74%. There were 21,615 households, out of which 31.50% had children under the age of 18 living with them, 59.00% were married couples living together, 10.50% had a female householder with no husband present, and 26.80% were non-families. Nearly 24.30% of all households were made up of individuals, and 10.50% had someone living alone who was 65 years of age or older. The average household size was 2.47, and the average family size was 2.92. In the county, the population was spread out with 24.20% under the age of 18, 8.30% from 18 to 24, 28.70% from 25 to 44, 25.40% from 45 to 64, and 13.40% who were 65 years of age or older. The median age was 38 years. For every 100 females, there were 95.10 males. For every 100 females age 18 and over, there were 92.00 males. The median income for a household in the county was $32,020, and the median income for a family was $38,082. Males had a median income of $29,777 versus $20,990 for females. The per capita income for the county was $16,000. About 10.30% of families and 13.70% of the population were below the poverty line, including 17.20% of those under age 18 and 21.00% of those age 65 or over. While most of North Alabama became solidly Republican during the 1970s, Jackson County up through the 2000s remained a stronghold of the Democratic Party for elections to local office (residents are not usually liberal, however; see Dixiecrat and Southern Democrat). Until November 2012, Democrats were elected to Jackson County government. In that year’s general election, two Republicans were elected to the Jackson County Commission—the first Republicans to serve on the Commission since Reconstruction. There is now an all-Republican political delegation in Jackson County. Tommy Hanes and Ritchie Whorton represent the county in the Alabama State House of Representatives. Steve Livingston serves Jackson County in the Alabama State Senate. In the, 2004 Presidential Election, Jackson County voted for Republican George W. Bush over Democrat John Kerry. It was the first time Jackson County voters had chosen a Republican presidential candidate over a Democrat since 1972. In 2008 Republican candidate Senator John McCain won the county with 67.7 percent of the vote. In 2010 Republican gubernatorial candidate Robert J. Bentley received 56% of the vote, Republican House candidate Mo Brooks received 55% of the vote, and incumbent Senator Richard Shelby received 70% in the county. In 2010 Democratic politicians continued to be elected to local positions such as County Sheriff and the school board. The current Jackson County Commission is headed by Chairman Matthew Hodges. ^ "Jackson County Commission gains its first Republicans". Retrieved October 22, 2016. ^ "President Map – Election Results 2008 – The New York Times". Retrieved October 22, 2016. ^ "County Results - Election Center 2010 - Elections & Politics from CNN.com". Retrieved October 22, 2016. ^ "Chuck Phillips elected sheriff in Jackson County; Cecil Gant to school board". Retrieved October 22, 2016. The Heritage of Jackson County, Alabama, Clanton, Ala.: Heritage Publishing Consultants, 1998. Kennamer, John Robert. The History of Jackson County, Alabama, Scottsboro, Ala.: Jackson County Historical Association, 1993. Wikimedia Commons has media related to Jackson County, Alabama. This page was last edited on 3 February 2019, at 20:05 (UTC).